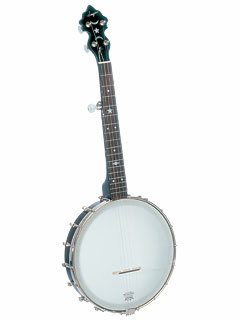 Take this "Old-Timey" banjo anywhere! The SS-10P is the perfect banjo to keep in the car, in the office or even attached to your back-pack for that long weekend hike. The sound, and playability will instantly take you back a hundred years with its traditional sound and design. Just one look and you will agree its certain to become a universal favorite. > Open-back "Old Timey" style banjo. > Slim fast 17th fret, mahogony neck. > East Indian rosewood fingerboard. > M-O-P star and moon peghead inlays. > Saga script logo on the headstock..
> M-O-P star inlays at the 5th and 12th frets. > Rolled brass tone ring. > 4:1 ratio, Golden Gate planetay tuners. > Designed for open "C" tuning.